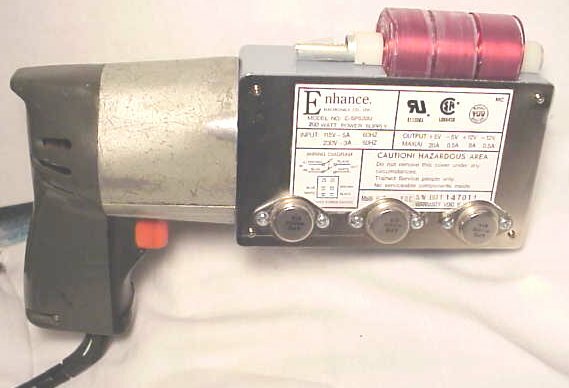 A photo of the Mark I, showing a drill handle mated to a plastic enclosure carrying three firing coils on the top. The lid doubles as a heat sink, where three power transistors are mounted. The lid was salvaged from PC power supply and cut down to fit; it still carries the original warning sticker. Capacitors are mounted externally through wire bundle (instead of original power cord) through the handle grip. The Mark 1 was my first effort. In my ignorance at the time, there are lots of things wrong, primarily in wire size (much too thin) and coil inductance (far too high). Here's a visual animation of a coilgun. It shows my chosen projectile (a screw) being accelerated down a series of coils. My design uses four coils, with two coils at a time being turned on. The coils glow yellow in this picture while they are energized. Just as the screw nearly reaches the middle of the energized coils, the trailing coil turns off and the next one turns on. This animation is slowed to one-quarter speed of real life.